Cognitive systems: the future of banking and finance? Cognitive computing and its impact on the financial services industry were the hottest issues for debates at recent Sibos 2016, the world’s major banking and financial conference held on 26–29 of September. At this event, Ginni Rometty, Chairperson, President and CEO of IBM, argued that cognitive systems would be the cornerstone for future leaders of the banking and finance industry. The latest IBM 2016 Cognitive Bank Survey also states that cognitive computing can radically change the banking and finance sector. IBM engaged with over 2,000 C-suite industry professionals, and 79% of those bankers familiar with cognitive computing pointed out its critical role in shaping the future of their business. 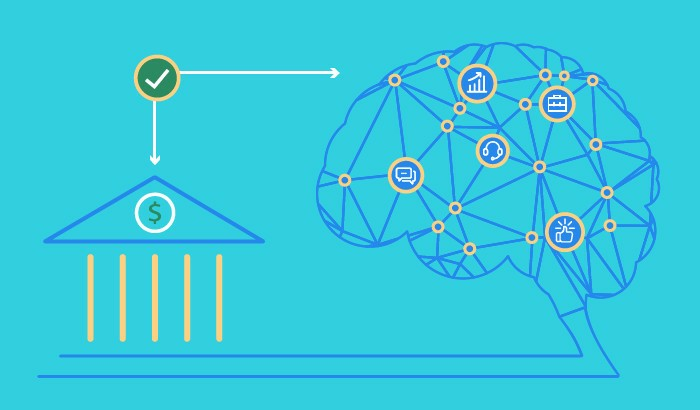 With this IBM’s push to rethink analytics for banking and finance with cognitive capabilities, let’s have a closer look whether this innovation is really worth introducing. The main challenge for most banks and financial institutions is the paradox of having too much data and too little insight. That usually comes from using traditional analytical systems, which focus on examining “historical” data from relational databases and reporting answers to users’ queries. Cognitive analytics, in contrast, allow to crunch a company’s big data as well as external information sources to forecast future events and behaviors as well as give recommendations on the most rational behavior in a given context. Thus, cognitive systems allow conducting what-if analyses to predict the effects of potential changes in business strategies. One of the drawbacks of current analytical systems is customer segmentation according to predefined requirements. Traditional systems model the future customer behavior based on past actions and usually use broad segmentation treating all customers the same within the same range (e.g. age, income, etc.). Cognitive systems, by contrast, can make a much more accurate and timely analysis of an individual’s personality based on big data and customer behavior in different situations (e.g. company’s transactions, unstructured sources such as CRM notes, surveys, social feeds, etc.). This system can allow banks to customize products and services for each customer enabling intelligent targeting. Besides, cognitive systems continuously learn new information and step by step apply more proficient knowledge to deal with various types of problems. Taking into account all these possibilities, we suggest 3 ways to apply this emerging computing paradigm in practice. Cognitive analytics can bring value to banking call centers by helping to assist customers in a more personal way. With the ability to recognize natural language queries and process unstructured data (e.g. an online text as a source), cognitive systems can provide guidance to service agents during customer communication. Since cognitive systems “understand” the problem, they can provide effective solutions without redirecting calls to multiple departments and therefore saving customers’ time. Cognitive solutions can also improve such banking services as loan underwriting, requiring transparency and confidence to make an informed decision. By using artificial intelligence, both customers and loan counselors can get comprehensive information on whether someone qualifies for a loan or not. Cognitive systems allow consolidating personal data from several sources into a holistic profile, reducing the amount of time needed for research. E.g., Australian ANZ Bank with $889.9 bn. in assets started applying cognitive computing in the advisory and risk management areas. After loading the system with files including product disclosure statements, market data, financial statements, etc. and creating a thesaurus of non-standard terminology, the bank managed to remove 1000 hours of back office activity and increase automation by 50% with cognitive computing. Thanks to the new technology, about 150,000 customers can now receive immediate answers to their loan applications. Business investing is another area which can be greatly improved by cognitive computing. Making an investment decision may take an excessive amount of time while seeking answers and insights from various information sources. Using cognitive systems, banks can rapidly go through investor information sources to explore the latest market changes, calculate risks and limits as well as get recommendations that consider customers’ personal profiles. Thus, banks can provide businesses with up-to-date advice. E.g., DBS Bank from Singapore with $332.6 bn. in assets has already implemented this technology to provide highly customized investment ideas for its customers as well as to identify customers’ needs in wealth management to determine the best financial options. But despite these positive perspectives, the North American banks are still cautious to implement cognitive technologies. Currently, only Citibank entered the exploratory agreement on the use of IBM’s cognitive technologies. Senior bank executives point out that such software could help them achieve cost-cutting goals in the coming years, but at present they are more focused on short-term results rather than making investments that do not offer an immediate payoff. According to Accenture’s research, in 2015 US banks spent $62 bn on technology, but only a fifth of this sum was allocated to innovative projects such as cognitive analytics. Taking into consideration major industry challenges such as commoditization, discerning customers and disruptive competitors, we assume that it can be the right time for banks and financial institutions to rethink their current strategy. This article originally appeared on ScienceSoft Blog and has been republished with permission.